Sometimes even the slow moving turtle can wander away and get lost. Two of the new geese at the Reservoir over past few days. Hoping that among them, are Napoleon and Josephine. Constant fishing now at a water bird empty Harlem Meer. In the past few days, I have been to Harlem Meer in Central Park twice. In sharp contrast to only a few years ago (or even a couple of weeks ago when nearly 20 geese flew in around Memorial Day), there were no geese and only a few ducks. The lake appeared completely bird-empty on both recent occasions, including yesterday. I thought to myself last night that the long walk to the Meer was a complete waste of time. 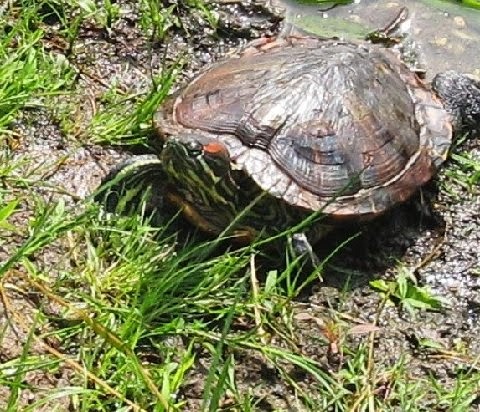 I turned to leave what then seemed a barren wasteland yesterday, but when walking up a hill towards the Park Drive, I discovered a fairly large turtle who had wandered quite far from the lake and appeared distressed. The turtle was apparently trying to make his way back to the water, but was unable to crawl under the wire fencing that blocked his path. I picked up the turtle (who quickly retracted his head back into shell) and carried him in my hands back down to the lake. I gently placed the turtle on the embankment, close to the water, and then thought about taking a photo. But, by the time I got the camera out of my bag, the turtle had jumped into and vanished under the water without so much as a "thank you" or look back. Oh well. At least the trip to Harlem Meer had not been a total waste of time. One turtle was happier and back in his natural element. Several new geese have flown into the Reservoir over the past few days, bringing the number up now to 21 -- including the family with two surviving baby goslings. One of the surprising observations last night was that the family (Hansel, Greta and their two babies, Rover and Rema) was swimming in the same area and seeming to accept the adult group of five geese that ended up as temporary "babysitters" for the little wandering Rover a few days ago. While joking the other day that the gaggle of five probably led and dropped off Rover to his frantic parents when he went missing, that theory might not be so far fetched after all. The two gaggles seem to be friends now, though the family maintains higher status than the group of five singles (or other geese at the Reservoir). That is just typical goose rule and hierarchy. Families always have priority. Perhaps Hansel and Greta figured out that they need outside babysitting help to try and reign in and keep watchful eye on their now wandering brood of two. In other matters, despite the non-stop harassment conducted on the geese at Central Park, I am not particularly concerned that a USDA WS "cull" will occur at the Reservoir. It would be close to impossible to pull off these kinds of shenanigans without being witnessed by hundreds of people and nor are the sloping, ragged rocks or iron fencing that surround the Reservoir easy to navigate. The Reservoir is the one Central Park watercourse that even Geese Police doesn't go. But, that doesn't take the sting and bitterness out of all this. Though I picked up the turtle yesterday and returned him to the lake at Harlem Meer for his own safety and well being, I left the trash and bottles discarded in the grass. These parks have made their beds and prioritized their choices. good for you...I FEEL like bringing my trash bag and dumping it there. By all means, feel free to. All garbage is welcomed in NYC parks. Maybe the turtle didn't get lost as much as he was trying to escape.